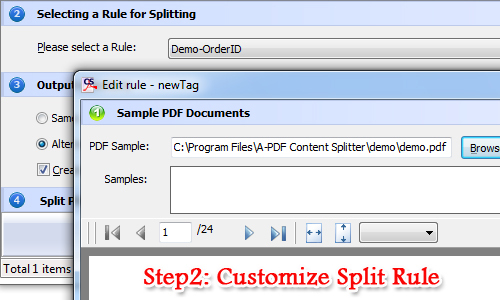 How can I create a new splitting rule to split PDF files by content with A-PDF Content Splitter? I would like to split some content from my large PDF file. So I get A-PDF Content Splitter. And now I am wondering how to create a new splitting rule to split the content I need easily. Would you please tell me the solution in simple word? If you want to split some important contents from large PDF file, then you may need a useful PDF splitter to make your work easier. A-PDF Content Splitter is a useful and affordable PDF tool to split content from PDF file with ease. For one thing, A-PDF Content Splitter is easy to use; for another, you can customize the rule to split the content as new PDF file simply. Now let's go ahead to show the steps to customize the rule and split the content simply. First of all, import PDF or PDF folder to continue. Click add button to import the local file to A-PDF Content Splitter. 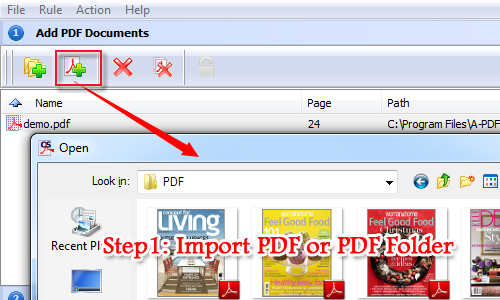 If you would like to remove the PDF file, just click delete button with ease. After that you can select a rule to split the PDF file. A-PDF Content Splitter provides several default rules for your reference. However, you are able to create a new rule to split the content as well. Just click the add button to add and edit your new rule. Before you split the PDF, you have to customize the output directory first. You can choose to save file as original or alternative directory. Finally, move to the final step. That is to click split button and start split the content from PDF file.